← NASCAR sports on the decline; what’s the cause? It was eight years ago that the NBC television network broadcast a program entitled Restaurant: A Reality Show. During the show, an advertisement by American Express alleged “90% of restaurants fail during the first year of operation.” A high restaurant failure rate was an enduring myth even before that broadcast. The study also examined restaurant turnover rates based upon the density of restaurants compared to population in different areas of the city. Restaurant turnover was highest in areas with higher concentrations of restaurants. In other words, the greater the number of restaurants for a given population, the greater the failure rate. 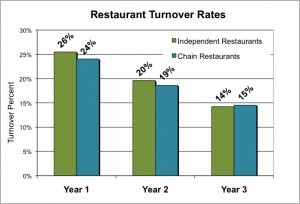 This is not at all surprising, as the greater the number of restaurants for a given population, the greater the competition is for each customer’s restaurant expenditures, indicating that market demand research should be a prerequisite before opening any restaurant. The study’s authors not only examined quantitative data, but also conducted a qualitative study to determine reasons for both success and failure. Twenty independent full-service restaurant operators who had been in business for at least five years and 20 failed full-service restaurant operators were interviewed. The key finding of the qualitative study was that a successful restaurant requires focus on a clear concept that drives all activities. Concept is different than strategy. Whether or not operators had elaborate strategic plans was not a determining factor for success, but clarity of concept was. Successful restaurant owners all had a well-defined concept that not only provided a food product, but also included an operating philosophy, which encompassed business operations as well as employee and customer relations. Failed restaurant owners, when asked about their concept, discussed only the food product. The researchers concluded it was obvious from the interviews that food quality does not guarantee success; the concept must be well defined beyond the type of food served.